The table is representative of the dimensional aspects or elements of life, energy as it cross-relates in depths from a low to high or high to low density. Blue section is the current referencing or conscious position of realities of density of matter. 3rd Dimensional comprehension; As words are lighter they become less of a need as thoughts take over as prime focus then duly as thoughts become lighter then emotional focus, reality becomes relevant for referencing and communicating then duly Vibrational state as the trend goes towards a lighter finer thinner less harmful less restrictive. Anything that is related or created from the conscious position of referencing or relating to reality has therefore the parameters of that position. Whereby what we inspire to create includes 2 dimensional realities as does creations in emotional realms include 3 dimensional realities and in Vibrational realms 4, 3, 2 dimensional realities …etc. As you as individual broaden yourself and deepen your reality you inspire with that in situe of your positions of energy. The table therefore is not a defined item but a representational table of dimensional comprehensions of positions. It can mix and match and jump without conscious knowledge but the aspects have to be there to bridge the comprehensions within our inner selves. How you act inspires act of the same magnitude and potency. Energy learns from intent and evolves from self as a means of inspiration to a direction to evolve it and duly inspire by intent to others. Therefore what we do in means of inward action Vibrational, emotional, mental, physical transpires the same externally to all life forms. The spider becomes denser as a life form by means of energy and intent, disease and viruses are transpired from attitude towards that energy becoming by not wanting it to become what it is from source transpired from our intent not to purify reality rather than treat or amend it. Cannot change that to which is external to us but accept and inspire it to become that other than what is harmful, how it evolves is how we evolve. The evolution is predominantly focused towards denser or harder matter rather than lighter or finer matter less harmful hence directional focus is that the matter becomes harmful to create the connection with relativities of reality. Thousands of years of denser directional focus has become the reality seen today, thousands more will become that which we inspire now, giving directional focus to a trended cycle of sub-conscious events from within to inspire and adhere to purity rather than adapt and amend something we cannot change. By means of our own desire we request the energy to become that to which it is so it can be adapted and amend by means of interaction. 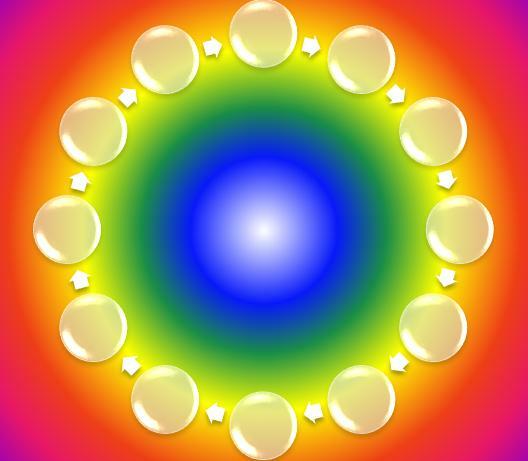 Life becomes easier when the Vibrational aspect are all met so the emotional and physical becomes complete and pure. The planet is already in direction for this phase to come about feeding off of and inspiring the Universe to the same to send and receive energy to adhere to the purification of itself and us. The potencies and Vibrational mannerisms of humanity is changing to a lighter more harmless attitude more emotional trends due to this act of planetary soul-evolvement. Flowing with the waves of energy adhere to all needs of humanity matter, emotion and vibration as it i.e. us is part thereof the same. Falling in line with the changes towards these aspects grows and gives weight or potency to the desired outcome continuously moving and shifting forwards to the desired intent of the self and planet. Abilities and aspects of commerce change to meet the Vibrational aspects being inspired by individuals to create a reality by means of conscious comprehension that suits the group or culture or society. What we inspire we become. 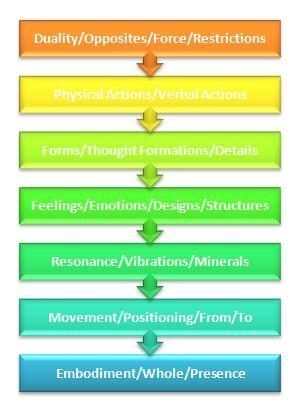 Vibrational, Emotional, Mental, Physical modules are like tools to assist in the aspects of evolvement of all life forms. Greatest capacity exists within the human development to cross-divide the physical to Vibrational aspects of dimensional energy. Where to position the energy and how too meet desired functions of reality. Awareness of said modules, to read the Vibrational aspects of self is a reality of sensing, the emotional aspects is reality of feeling and mental, thought aspects is a neutral comprehension of polarity fields and then the physical polarity of this way or that, good or bad, yes or no…etc. You still go about the physical with the same regard but also give intention to become aware of the mental thoughts relative to the moment the neutral comprehension before the outcome of the physical action, words, movement attitude. The emotional depth gives weight to the intended feeling and reading of the moment and the Vibrational is the purer reach whereby the sense of not really meaning that or could of said that differently or illusion. The aspect of whole self inclusive of emotions, thoughts, physical. Responsibilities arise when the truth of the intended becomes the reality of thoughts whereby pure thoughts inspire calm soft harmless realities. To which learning and evolving calmly occurs, the harsher aspects of intent denser vibration are more restrictive to decipher and interpret as more energy is involved to create or sustain the density. The dimensional table is to represent the aspects of shifting through dimensional positions and also whereby the positions of self relate. You can have a high Vibrational link towards say your family and low link towards work and whereby the combination of all aspects of your self become present by means of becoming whole and centre to see firstly the aspects truthfully of the self. Cannot lie inwardly as the lie negates the aspects of seeing. Basically telling your consciousness by means of a lie that you do not wish to be aware of this element consciously. The act of denial affirms its existence. For something not to be there firstly must be present to inspire the attitude towards not being there.